Half a 25-pounder battery, these ones with the one-piece resin bases. Which I have learned to hate. Terrible things, BF should simply have made the scenic "dug-in" bits in metal and sold them separately, much easier. The first completed platoon of Hungarian infantry, painted to represent a platoon from the Motorised Infantry (blue collar tabs). These were done with Mid War in mind, though usable for Late War and the defence of Hungary in 1944-45 as well. Figures by Battlefront. The mix of poses is OK, some more variety would have been nice but the larger-than-normal platoon size also means you tend to see the same poses more easily. These do get rather monotonous; the whole platoon seems to take ages to get done. That and my project-ADD does not help either. The plan is...there is no plan. As with most wargaming projects I start, something catches my interest and a few days later I'm drowning in research material, writing list after list trying to fit in everything I want (what I want in the force, what I need, what is too cool to leave out) and planning purchases. It's a disease I tell you. After establishing that I am going to do this. For real. Unlike the 20 or so other "planned projects", each of which has a folder with pictures, resources, books lists, relevant websites saved, and so on, and which I was equally serious about at some time or other and might still do in the future. Honest. A quick look at the Battlefront figures and list in Dogs and Devils and a plan starts forming. Another infantry force, joy. Still, this one rates pretty high on the "cool" factor, and besides, they can "morph" quite easily to other HG and Luftwaffe ground forces in other theatres without being too inaccurate. 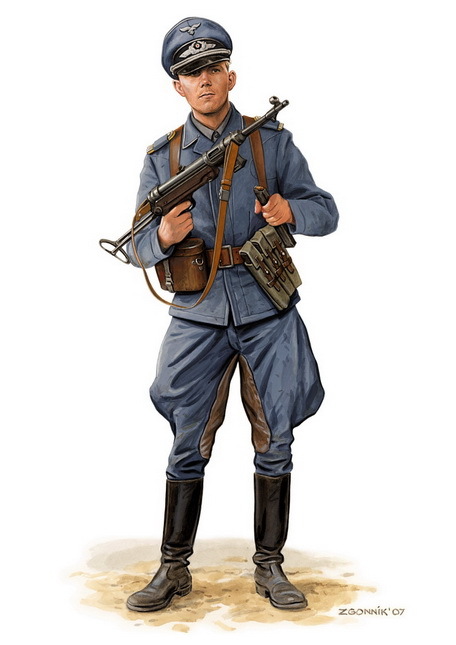 Having Anzio and the subsequent breakout battles in mind as a setting for the initial force, they will work alright for HG troops after the division was transferred to the Eastern Front, the battles on the Vistula against the Soviets (and beyond), as well as for earlier battles in Italy (Salerno and beyond) and at a pinch for Sicily and Tunisia. I don't intend doing tropical uniforms for the latter two, though the units will be correct in number and organisation if not in uniform details. 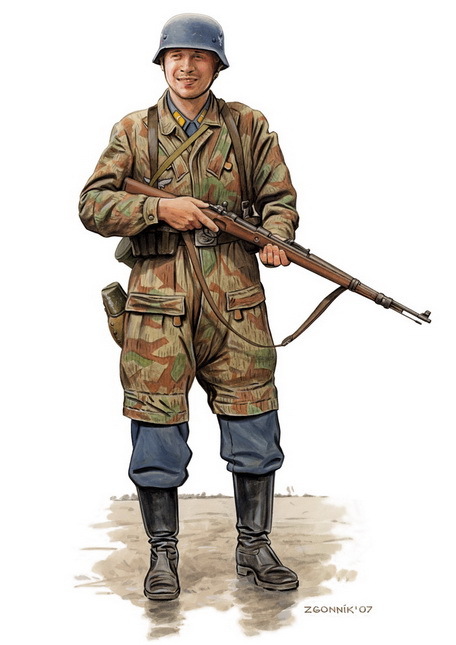 They can also be used for a Mid-War Luftwaffe Field Company for the Eastern Front. That is about as far down the "specialised force" road I want to go. Self-justification is an art. 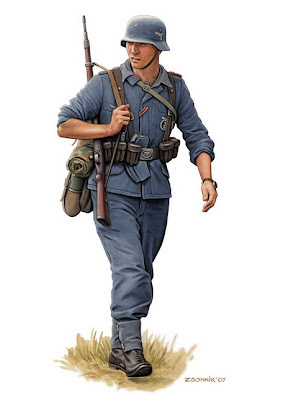 Having a look at the examples on the Flames of War site, for instance the HG Panzergrenadier Platoon and HG Panzergrenadier Company HQ painted by Matt Parkes, the figures have a very "part historical, part aesthetic" look to them, something that appeals to me as a painter. Luftwaffe splinter mixed with some Luftwaffe blue item creates a very attractive mix to me, even if the amount of LW blue items are perhaps over-represented for later periods. Despite the fairly rushed nature of some parts of the painted figures (e.g. 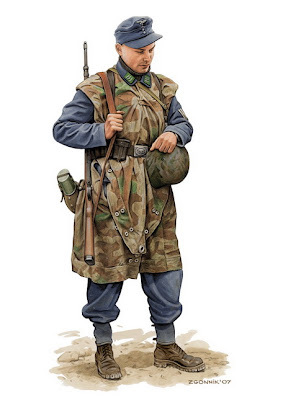 the quick splinter camouflage) the figures have a certain "pop" to them by the addition of line highlights over a simple single colour or at most two. Many are similar (if not identical) to the Luftwaffe Field Platoon figures I painted ages ago: cartoony in sculpting style, if quite easy and enjoyable to paint. ...fantastic. I'm wishing my ordered figures were here already. A platoon of M5A1 Stuart light tanks, Battlefront vehicles. The whole "individually sculpted" thing is pretty poor on these, nowhere near as good as the M4A1 Sherman box for instance. Still, pretty good models, my only complaint is concerning the track sections which are not identical in length: one side (can't remember which side now...) is about 1-1.5mm longer than the other. I've tried to hide this in the front and you can't see much difference in the pictures though with models in hand it can be seen. Not a "huge problem" (aka the Easy 8 tracks) but nonetheless an annoying one when paying a premium for five small light tanks. Also, the 37mm barrels BF supplies are complete and utter rubbish: replaced here with barrels made from clipped metal spears, the one Northstar Miniatures sells. Not a perfect re-production and a pain to do, but far better than the alternative. A few quick shots of some Mediterranean Commando figures. Figures by Battlefront, from their BR blister. Painted here to match previous stuff. How I do it, not necessarily how it has to be done. I've been meaning to do this one for ages. I started it quite some time back, then misplaced half the pictures of the painting bits so had to re-do them, new ones probably turned out better anyway. This might sound a bit long-winded in the text, though the actual process is very simple. I start off by scoring the plastic bases (or MDF if you're using that instead), not too heavily, but enough to give the glue something to "grip". After scoring I "dry fit" the figures: this is simply to establish the position of each figure, i.e. where I want it to be, and also allows me to place weak parts, i.e. MP40 barrels and rifles with bayonets, either to the inside of the base, or at least facing somewhat inward to protect them. Notice the rifleman below with the spike bayonet was place to the inside of the base exactly to protect the weapon. In the case of this particular pose the figure could be positioned anywhere in the middle area of the base or even the far right with weapon facing inwards, however I would never place this figure on the far left of the base as the weapon and bayonet will only take unnecessary damage there. Just something to consider. Note: If the figures have especially thick bases (say more than 1.5mm) I file them down during cleanup, before undercoating. This helps with basing since you don't need to add as much basing material to build-up to the level of the bases. After the position of the figures has been established, I mix up a sufficient quantity of a two-part epoxy glue, usually enough to do 1-2 bases at a time, and spread about a 1mm layer over the base. For years I've used Pratley Quickset White glue (4th one down), though anything similar will do the job. The figures are then placed in their positions. By gently pressing the figures into the glue, a (not particularly strong) "suction" is created, pushing glue from under the base to the sides. This will help later when applying sand to hide the figure's lead bases. Gun are done in a similar manner, though before undercoating I glue small pieces of plastic card or cardboard under each wheel or trail to act similarly to the figure's lead bases. This prevents the guns from being "buried" into the basing, a common problem that this easily fixes. Dry fit, note the plastic card bits glued to the Nebelwerfer to act as "bases"
After the epoxy glue has dried for at lest a few hours (preferably overnight), the next step is to apply sand to the base. In the picture below you can see a simple mix I use, of fine-grained plaster sand mixed with smaller amounts of larger particles (river sand in local terms). I apply a layer of Wood Glue (PVA/White glue, etc.) over the base, moving the glue with a cocktail stick/toothpick to cover all the base except the beveled sides. I also place some glue onto the figure's lead bases to help hide them. This doesn't show too well below as the glue is also white, though you can see the glue on the figure bases to the left. Once done, place in the sand mix and cover. I leave the base completely covered for 30 minutes or so, to get a good layer of sand over the base. Again, this helps to hide the bases as more sand is actually "glued" in place rather than a thin layer and this covers them better. Don't overdo the wood glue though, as you can add too much. Again, about a 1mm layer spread over the base should prove sufficient. After 30 minutes, take it out, tap off the excess and leave to dry completely (6 hours or just overnight). At this point you can still remove larger particles (rocks), so if you have a running figure and he's about to run into a rather larger boulder, best remove it and repair any gaps with more fine sand. After the wood glue has dried completely, I take a soft brush and brush off the excess sand particles. Then on to painting. I use a pretty simple base painting process which looks much longer here than it actually takes. 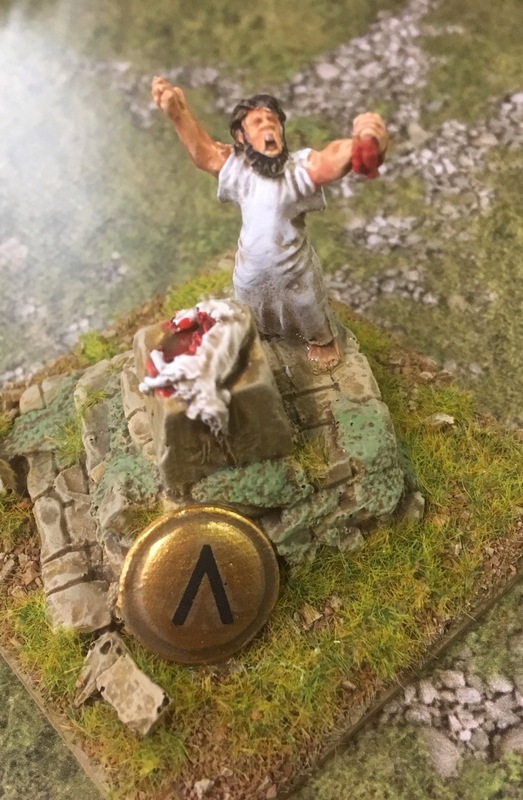 Here I've used the same colours you can see on many of my infantry and gun bases on the blog: it is not particularly "realistic", but is does look fairly good. Since I used this scheme on several projects, I've continued to use it to match units within the same army. Any similar colours can easily be substituted, e.g. Vallejo, and Vallejo undoubtedly covers better and faster. This base however had to match the rest of the platoon, and the colours used reflect this. To start off, I paint a thinned layer of Flat Earth (or equivalent) over the base. In my case I had a litre mixed at a paint shop to match the Vallejo Flat Earth colour. This is thinned somewhat, still being able to cover but without clotting the sand detail. It also acts as a binding agent on the sand and binds any tiny particles to the surface. Paint carefully around the figure's boots and such; I use old knackered small brushes for this. Leave to dry for awhile...until it looks dry. After the first layer has dried, I apply a wash of thinned Americana Chocolate Brown, mixed about 1:1 with plain water. This is applied over all the base, enough to pool in the details but not "flooded" over the entire base. Again, paint carefully around the boots or any prone figures, and so on. Dry-brushing begins: here I used Americana Raw Sienna. This was heavily dry-brushed over the sand, attempting to cover as much of the base as possible while leaving the darker brown in the recesses. Next, I dry-brushed a layer of Americana Honey Brown, more lightly this time, attempting to catch the raised details of the sand and leave the rest untouched. I then pick out the rocks. To match the previous British Airborne Troops I've done, these rocks were done in grey, first layer Americana Payne's Grey, a dark blue-grey though any similar will do. Originally taken from my Middle Earth basing for Lord of the Rings figures, the grey rocks are again not particularly realistic, but look alright. After the initial coat of dark grey, I add small amounts of white to the mix until, doing 2-3 layers on the rocks, the last being quite light and aimed more at catching the edges for definition. Dark Grey applied to "rocks"
After painting the base completely and letting them dry sufficiently, I make a dilute mix of wood glue and water, about 70:30, and spread this over the base in an irregular pattern. I then cover the glue with static grass, and leave to dry overnight. This ensure a far better coverage of static grass than the "dip and tap off excess" approach. In this example I've used Noch static grass (spring or summer, don't remember which one it was exactly). If it looks time consuming and complicated, it really is not. In the time it took to put this together I could have based a couple of platoons, easily.